Don’t forget to download the free training manual to use in your planning! 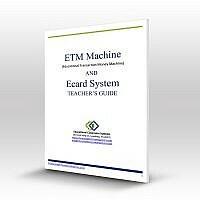 The ETM Machine® is easy to use for both teachers and students. It is used in conjunction with the Ecard System. The ETM Machine® is small, lightweight and portable. It can be clipped to a waistband, pocket, belt or lanyard. It comes with rechargeable batteries, an AC adapter, and a USB cord to download student accounts onto a spreadsheet. Students simply swipe the Ecard across the top of the ETM Machine® and press either deposit or withdraw, punch in the amount (using a decimal point for cents), and hit total. It’s that simple!